The ability to detect buried objects, underground obstacles and anomalies in soil strata is of great interest to civil and environmental engineers, but also to archeologists, forensic experts and military and civilian specialists involved in land mine removal operations. A number of geophysical methods: electromagnetic, electric resistivity, inductivity, conductivity and infrared based methods, gravitometric, ultrasonic and seismic methods, can be successfully used for this purpose. Each of them has some advantages over the others, but also some limitations with respect to the ability to define the position, size, shape and engineering properties of the sought object or anomaly. Such limitations often lead to a complementary approach in a solution of problems where high precision and reliability is of an outmost importance. A strong side of seismic methods is the ability to measure and characterize systems and objects in terms of their elastic properties, i.e. elastic moduli, stiffness, damping characteristics, rigidity contrasts and presence of discontinuities. Use of surface waves in shallow seismic explorations became especially attractive with the development of the Spectral Analysis of Surface Waves (SASW) method (Nazarian and Stokoe, 1983). While the SASW method is primarily used for evaluation of elastic moduli and layer thicknesses of layered systems, like pavements, soils, landfills, etc., investigations have demonstrated potential use of surface waves in detection of anomalies. Haupt (1977), Dravinsky (1983), Curro (1983) and Gucunski et al. (1996a) demonstrated, numerically and experimentally, that surface waves are sensitive to anomalies close to the surface. Recently, Al-Shayea et al. (1994), Avar and Luke (1999), Long and Kocaoglu (1999), Its et al. (1999) and Park et al. (1999) used surface waves in laboratory and field measurements in detection of anomalies, and measurement of their effect on wave fields. Al-Shayea et al. (1994) demonstrated in the laboratory that cavities in the ground can significantly affect results of SASW testing by causing a decrease in the phase velocity of surface (Rayleigh) waves in a broad frequency range. These findings were later confirmed by numerical simulations [Gucunski et al. (1996b)]. Its et al. (1999) demonstrated in the laboratory that embedded vertical barriers cause significant scattering of surface waves, producing a major amplitude reduction behind the barrier, and amplification in front of it. Park et al. (1999), Avar and Luke (1999) and Long and Kocaoglu (1999) performed field tests using surface waves for the purpose of detection of a tunnel, abandoned mines under a pavement and anomalies in a shallow soil layer, respectively. Park et al. observed higher velocities and larger attenuations of surface waves above the tunnel, which they attributed to higher Rayleigh modes (Gucunski and Woods, 1991, Tokimatsu et al., 1991). Avar and Luke observed a shift between forward and reverse direction dispersion curves to detect a cavity under the pavement. Finally, Long and Kocaoglu used multiple filtering to isolate the fundamental Rayleigh mode and measure the group velocity for the purpose of a surface wave tomography. The paper discusses field implementation of a recently defined Surface Waves for Obstacle Detection (SWOD) method (Ganji et al., 1997). The first part of the paper discusses the theoretical background of the SWOD method. The second part discusses procedures for the implementation of the SWOD method in the field. The application of the method is illustrated by a series of tests conducted for the purpose of detection of a cavity under a pavement. The Surface Waves for Obstacle Detection (SWOD) method was developed as an extension of the SASW method (Ganji et al., 1997). The procedure was defined from the results of numerical simulations of the SASW method. The numerical study was conducted on finite element models of a soil stratum with obstacles of various sizes, shapes and densities (buried objects and cavities) (Fig. 1). Several important observations were made from results simulating a movement of a pair of receivers (similar to the SASW testing) in the direction of the buried object. The most important observation was that an object or a cavity causes fluctuations in the dispersion curve, as illustrated in the Fig. 2. The fluctuations are caused by reflections of both surface and body waves from the obstacle. The intensity of fluctuations increases as the receiver spacing decreases and as the receiver pair approaches the obstacle. The fluctuations vanish as the receiver pair passes the obstacle. The second important observation was that, if the receiver pair is placed to encompass the buried object, there is a general increase in the phase velocity of the dispersion curve for rigid obstacles, and a decrease for soft obstacles or cavities. A simple mathematical model,developed for interpretation of effects of underground obstacles on the SASW test (Ganji et al., 1997), demonstrates the ability of the SASW test to define both the position of an obstacle and approximate geometrical and density characteristics of the obstacle. Fig 1: Finite element model of a homogeneous medium with an obstacle. Fig 2: Fluctuations in the dispersion curve. Fig 3: Dispersion surface for a homogeneous stratum with a cavity. The SWOD testing procedure involves the movement of a closely spaced receiver pair in a straight line. For every receiver pair position the dispersion curve is evaluated and a composite surface plot generated, as illustrated in Fig. 3 for a homogeneous soil with a cavity 15 units from the origin of the coordinate system. If a buried object exists, there are fluctuations in the dispersion surface as the receiver pair is moved towards the obstacle. The fluctuations vanish as the receiver pair passes the object, thus identifying the obstacle position. Fig 4: SWOD testing on Rt. I-80. The SWOD technique was implemented on a section of interstate expressway I-80 in the northwestern New Jersey (Fig. 4). The objective of the testing was to detect a cavity/sinkhole under the pavement. The suspicion about the sinkhole presence was triggered by observed settlements of the embankment under the shoulder. The overall investigation included seismic and ground radar penetration (GPR) testing. 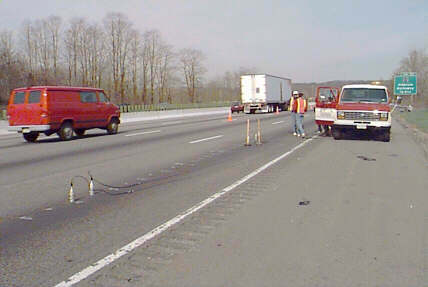 The seismic testing consisted of SASW for the purpose of pavement elastic modulus profiling and SWOD testing for the purpose of cavity detection. The test setup for SASW testing was of a commonly used set of measurements for various receiver spacings about a selected point. The test setup related to the SWOD testing is given in Fig. 5. Both the fast and slow lanes were tested 15 m east and west from the apparent cavity position. The SWOD testing was conducted using a pair of geophones at 0.5 m spacing. A 10 kg sledgehammer, placed 3 m away from the near receiver, was used as an impact source. Fig 5: Schematic of the SWOD test setup on Rt. I-80. Fig 6: Dispersion curves for four receiver positions on Rt. I-80. Fig 7: Dispersion surface for SWOD testing on Rt. I-80. Results consisted of dispersion curves and shear wave velocity profiles from SASW testing, and dispersion curves and surfaces from SWOD testing. The results of SWOD testing point to a possible presence of a cavity at the location of the observed embankment depression, but also of another one at about the 8 m point. A set of dispersion curves for four receiver pair locations: 3.5, 6.5, 8 and 10.5 m, is presented in Fig. 6. Clearly, fluctuations in the dispersion curve for the 3.5 and 6.5 m locations can be observed. The fluctuations vanish as the receivers move to the 8 and 10.5 m locations. The transition from the zone of reflections (dispersion curve fluctuations) to a more homogeneous zone (smooth dispersion zone) is illustrated by, and marked on, the dispersion surface in Fig. 7. The second possible cavity, at the anticipated sinkhole location, is also marked in the figure. The second cavity location was defined from a significant drop in the phase velocity at that location. This phase velocity drop covers the frequency range from about 110 to 180 Hz, or a wavelength range from about 1.0 to 2.5 m, indicating a relatively shallow cavity. A probable cause of the decrease is attributed to either a cavity or loosening of the subgrade material due to internal erosion. Numerical simulations of the SASW test on a soil medium with an embedded obstacle or other type of anomaly indicate that the wave field may contain significant wave components representing reflections from the obstacle. The reflected wave components cause fluctuations in the dispersion curve measured by a pair of receivers, especially for a small receiver spacing. The SWOD technique utilizes this phenomenon of fluctuations in the dispersion curve in the detection of buried objects. The procedure involves evaluation of the dispersion curve, or the dispersion surface, for a set of receiver pair positions in a direction of interest. The location of a possible buried object is determined from a point where fluctuations in the dispersion curve vanish. The results presented demonstrate a potential of the SWOD technique in detection of cavities and other anomalies under roads and highways in a karst terrain. It is recommended that the technique be used in conjunction with other geophysical techniques for this and similar purposes. Al-Shayea, N. A., Woods, R. D., and Gilmore, P. (1994), "SASW and GPR to Detect BuriedObjects," Proceedings of Symposium on Application of Geophysics to Engineering and Environmental Problems, March 27-31, Boston, 543-560. Avar, B. B. and Luke, B. A. (1999), "Roadside Application of Seismic Surface Waves Over Abandoned Mines," Proceedings of the Symposium on the Application of Geophysics to Engineering and Environmental Problems - SAGEEP '99, Oakland, California, March 14-18, EEGS, 31-40. Curro, J. R. (1983), "Cavity Detection and Delineation Research," Report 2, Seismic Methodology, Medford Cave Site, Florida, U.S. Army Waterways Experiment Station Technical Report GL-83-1. Dravinsky, M. (1983), "Ground Motion Amplification Due to Elastic Inclusions in a Half-Space," Earthquake Engineering and Structural Dynamics, Vol. 11, 313-335. Ganji, V., Gucunski, N. and Maher, M.H. (1997), "Detection of Underground Obstacles by SASW Method," Journal of Geotechnical and Geoenvironmental Engineering, ASCE, Vol. 123, No. 3, 1997, 212-219. Gucunski, N. and Woods, R.D. (1991), "Use of Rayleigh Modes in Interpretation of SASW Test," Proceedings of the Second International Conference on Recent Advances in Geotechnical Earthquake Engineering and Soil Dynamics, St.Louis, Missouri, March 11-15, 1399-1408. Gucunski, N., Ganji, V., and Maher, M. H. (1996a), "Effects of Soil Nonhomogeneity and Underground Obstacles on Site Characterization by the SASW Test," Uncertainty in the Geologic Environment: From Theory to Practice, Geotechnical Special Publication No. 58, ASCE, 1083-1097. Gucunski, N., Ganji, V., and Maher, M. H. (1996b), "Effects of Obstacles on Rayleigh Wave Dispersion Obtained from the SASW Test," Soil Dynamics and Earthquake Engineering, Vol. 15,223-231. Gucunski, N., Krstic, V. and Maher, M.H. (1998), "Experimental Procedures for Detection of Underground Objects by the SASW Test," Proceedings of the First International Conference on Site Characterization (ISC'98) Geotechnical Site Characterization, Atlanta, Georgia, April 19-22, 469-472. Haupt, A. W. (1977), "Surface-Waves in Non-Homogeneous Half-Space," Proceedings of the Conference on Dynamical Methods in Soil and Rock Mechanics, Karlsruhe, Germany, September 5-16, Vol. 1, 335-367. Its, E., Anisimov, A. and Kashkevich, V. (1999), "Physical Ultrasonic Modeling of Rayleigh Wave Field in the Near Vicinity of an Anisotropic Wave Barrier," Proceedings of the Symposium on the Application of Geophysics to Engineering and Environmental Problems - SAGEEP '99, Oakland, California, March 14-18, EEGS, 217-223. Long, L. T. and Kocaoglu, A. H. (1999), "Surface-Wave Group-Velocity Tomography for Shallow Structures," Proceedings of the Symposium on the Application of Geophysics to Engineering and Environmental Problems - SAGEEP '99, Oakland, California, March 14-18, EEGS, 85-94. Nazarian, S., Stokoe, K.H., II and Hudson, W.R. (1983), "Use of Spectral Analysis of Surface Waves Method for Determination of Moduli and Thicknesses of Pavement Systems," Transportation Research Record, No. 930, National Research Council, Washington, D.C., 38-45. Park, C. B., Miller, R.D. and Xia, J. (1999), "Detection of Near-Surface Voids Using Surface Waves," Proceedings of the Symposium on the Application of Geophysics to Engineering and Environmental Problems - SAGEEP '99, Oakland, California, March 14-18, EEGS, 281-286. Tokimatsu, K., Tamura, S. and Kojima, H. (1992), "Effects of Multiple Modes on Rayleigh Wave Dispersion Characteristics," J. of Geotechnical Engineering, ASCE, Vol.118, No.9, 466-468.